Patron of journalists: St Francis de Sales. TUCKED away in paragraph 70 of the his Apostolic Exhortation, Evangelii Guadium (The Joy of the Gospel), Pope Francis observes that “in recent decades there has been a breakdown in the way Catholics pass down the Christian faith to the young”. There are others better equipped and more credentialed to pull the thread of many of those influences but, in a week when we celebrate the feast day of the patron saint of journalists, St Francis de Sales (January 24), and as a former journalist, it is our engagement with the communications media that this column looks to explore further. It is easy to demonise the media and rail against the way it trivialises issues, such as politics, crime, economics and, of course, religion. And, yes, there is an obligation on the part of the commentators, editors and bloggers to strive always for accuracy and clarity. But the blame cannot be laid solely at the door of the Fourth Estate. Like politics, we get the media that we deserve. If we want the media, both secular and church, to lift its game, we have to raise our own standards in the process. We have to be more discerning in what we read and then how we respond to that content. Does a cheap headline grab our attention more than we would like to admit? Do tantalising images on a news web page prompt us to click through more than a graph about the dollar and its rise or fall? These questions are not posed glibly but are the product of my own self-reflection, ever since I started 2014 with a subscription to the online edition of The Australian. It was St Francis de Sales who first espoused the axiom: “A spoonful of honey attracts more flies than a barrelful of vinegar”. This is not to compare journalists to flies but rather, to offer the tip that providing positive feedback may be another powerful way of engaging more effectively with the media. I remember working as a suburban reporter on the Penrith Press, early in my career, when I realised that the only time I received any feedback about what I had written was if I had made a mistake in the copy (a mistake of fact, not opinion). Fortunately, it wasn’t often that I got it wrong (if the number of calls I took was any indication), but being fairly new to the profession, I did begin to wonder if I was really making any difference in the world, with my output. How different could it be for other media professionals if they were to receive some positive feedback at various stages of their career, from their readers? Why not single out a piece of writing that particularly resonates with you and let the author know how he/she impacted you? Or tell this august publication what you like about the new look. Visit a blog and leave a positive comment – cheap shots are easy, but less fulfilling for both the writer and the reader. A prolific writer himself, St Francis de Sales’ directed much of his message to lay people within the Church. His charter was to ensure that all recognised the God-given call to be saints. Engaging with the media is not incompatible with a life of piety or devotion. In fact, they are two of the qualities needed to be shown by those consuming the media, now more than ever. 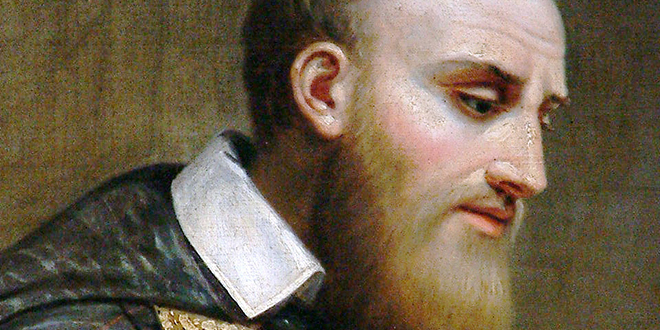 On Friday, January 24, the Church celebrates the Feast Day of St Francis de Sales. A former bishop and a qualified lawyer, St Francis is known as the patron saint of writers, authors and journalists. According to one website, Francis was destined by his father to be a lawyer so that the young man could eventually take his elder’s place as a senator from the province of Savoy in France. For this reason Francis was sent to Padua to study law. However, after receiving his doctorate and returning home, Francis was able to convince his father that his heart lay, not in legal briefs, but rather, in becoming a priest. Despite opposition, he ultimately was ordained and elected provost of the Diocese of Geneva, where he attempted to convert local Calvinists. He did this, partly, by preaching and distributing a series of pamphlets clarifying Catholic doctrine. At 35 he became Bishop of Geneva. While administering his diocese he continued to preach, hear confessions and catechise local children. After graduating from Charles Sturt University with a Bachelor of Arts, David McGovern worked for various media companies, including Rural Press and Cumberland Newspapers. He was public relations manager for Wesley Mission in Sydney for several years and now works as director of Catholic Mission, in the Archdiocese of Brisbane. He is a prolific user of social media, including Facebook, Twitter, Instagram and blogs.